Hey guys! I have more sunscreen recommendations to show you guys. I have said this for so many times and yes. People. Do remind yourself to wear sun screen every day! You might not see it but you will in years coming. Our weather is not as good as the old days, the sun rays. Sadly is getting worse. You need to get your skin protected. It is a must. If you still hesitate of using sunscreen because of how they leave you a greasy feeling, or smell like a beach boy or probably can't find one. I wanna recommend you this. It is a new sun screen from Skin Aqua. A leading brand for many types of sunscreen you can ever imaging. 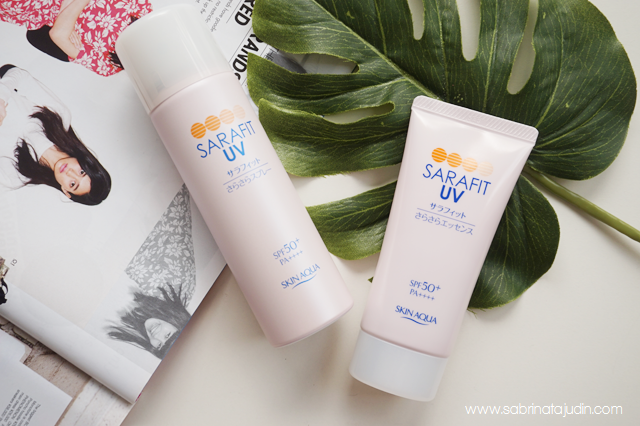 Said that it is formulated using the Double Silky Powder Technology, applying sunscreen just feels comfortable without the feeling of greasiness and stickiness even after you sweat. Contains Hyaluronic Acid, Super Hyaluronic Acid & Collagen to gives you ultimate hydration & skin elasticity. Oh yes, the tube and bottle is powder pink. I already fall in love with it. Comes in two form. One is a mist spray and one is the normal type of sunscreen they usually have which is essence. This is how they look like when applies. As you see below image, on the left bottom part is the mist. That is why I am in love with the mist as you can barely see anything on your skin. Application only takes a few seconds without the need to massage it in. The mist is very fine and finer than the usual face mist I had in my stash. Another thing that I love is it leaves a nice floral fragrance too. Oh! I found more new sunscreen to love! On the right side is the essence. Just like the usual sunscreen they have, but still good as it don't leave any greasy feeling or white cast effect when applied. So it depends on your preference. And if you are planning to find one of the, this is how they actually look at the display. This is how they came with, the usual cardboard packaging with more description of the product. 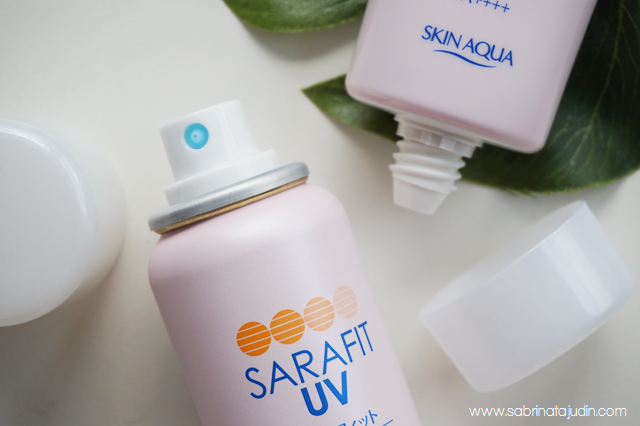 It might me an overwhelming thing to choose as Skin Aqua have varieties of sunscreen for you to choose from and from the display, you may need to look closely on which one suit you best. The packaging I think is originally from Japan, so they paste an English description version on the back for you to be able to understand and learn about the product. 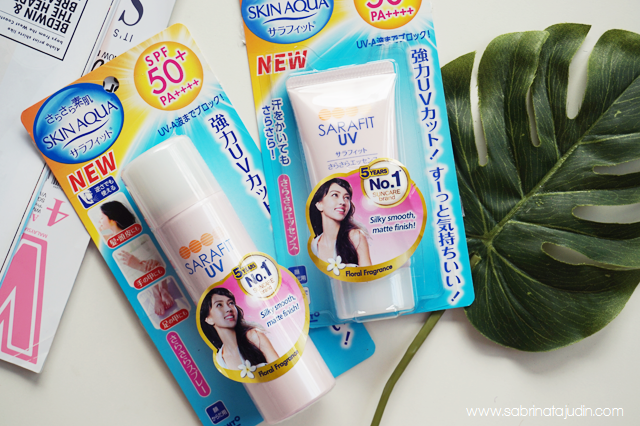 The Skin Aqua Sarafit UV Mist SPF 50+ PA++++ cotains 50g of product and retails for RM42.30 each. 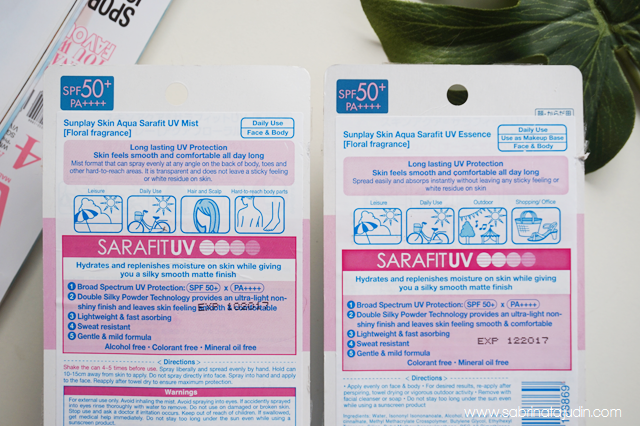 The Skin Aqua Sarafit UV Essence SPF 50+ PA++++ contains 50g and retails for RM40.00 each. You can purchase it from your local pharmacy store like Watsons, Guardian and many more. My favorite is got to be the mist as mention but I find that I can use both. 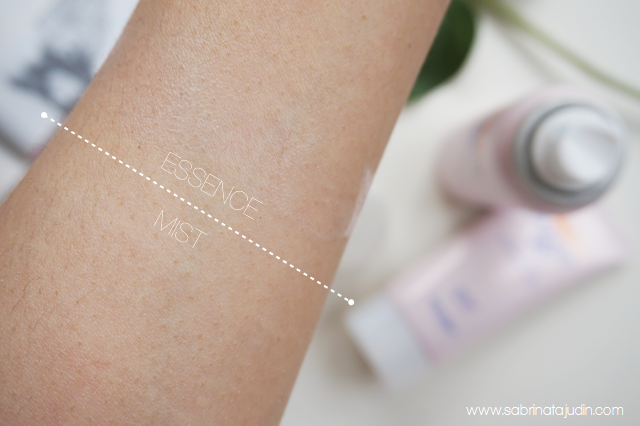 The essence can be include in your daily skincare routine while the mist can be an option for an application along the day and also great to be apply on areas that is hard to reach such as your back or neck or your entire body. Price wise are awesome for such a good product with great points to be love. You are gonna love the scent. Trust me! These sun screen are is alcohol free, colorant free and mineral oil free and suitable for all skin types.